87 W. Sierra Madre Blvd. $25 adults, $15 ages 21 and younger. 10 a.m., 1 p.m. April 13, 20, 27; 7 p.m. April 19, 26. 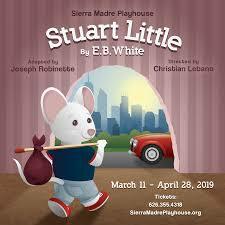 Families can catch Stuart Little at the Sierra Madre Playhouse this spring. This stage adaptation E.B. White’s much-loved tale delivers plenty of humor, heart and action as the audience follows Little’s big escapades. 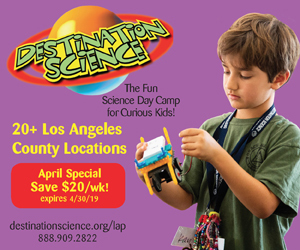 The Playhouse’s imaginative production incorporates puppets, projections, and original music to bring this unusual mouse’s fanciful world to life. This all-ages production is particularly good for ages 4-10.